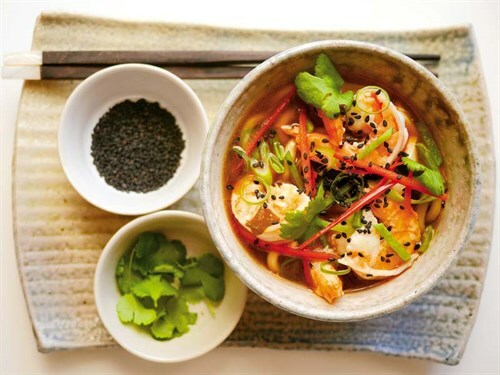 Check out this easy tiger prawn and miso broth recipe by Masterchef NZ runners-up Nikki and Jordan Shearer. Peel and devein prawns, reserve shells and heads. Heat oil in frying pan, when hot add shells and heads of prawns and cook over high heat. Stir frequently until starting to brown. Add onions and ginger and cook for a further 1 minute. Add wine and cook off. Add mirin, soy sauce and 500ml water. Cover and simmer for 15 minutes. In a medium pot, heat the other 300ml water with the instant miso paste. Strain all the liquid from the prawns into the miso broth. Stir in kecap manis, lime juice and fish sauce into the broth. Add tofu and udon noodles and keep hot on a low heat. In a small pan, heat sesame oil and fry prawn meat for approximately 30 seconds each side or until cooked. Divide noodles, tofu and broth between bowls. Top with prawns, spring onion, snow peas, capsicum and coriander.